​By Alex EliseevJOHANNESBURG - For months, my wife refused to climb onto a scooter with me. At first, she flat-out didn’t trust me. Then, realising that a learner’s license didn’t allow me to transport passengers, she used the law as an excuse. The law! So I plotted. And practiced. And finally passed my driver’s license, announcing that in order to celebrate, I was going to drive her for a lazy Sunday coffee in Parkhurst. In my mind, we would cruise the leafy Joburg streets like two teenagers in Rome. I would pull up outside a bustling café, kick back the bike stand and climb off like a cowboy. She would free her blond hair from the helmet and flash me a seductive smile, as we sat down to soak up the sun and bury our lips in cappuccino foam. We would laugh, people-watch and lose ourselves in the kind of conversation regular people - who aren’t parents to a three-year-old - tend to have. But the moment wasn’t quite ripe. My scooter is a 125cc and, although it’s a trusty steed, it would no doubt groan under the weight of us both. I didn’t want my fantasy to be ruined by a steep hill. Plus, I didn’t have a second helmet. But destiny hates being held hostage by such petty logistics and soon enough an opportunity turned the corner. Vespa South Africa had a sparkly GTS300 Super they wanted reviewed (coinciding with Vespa’s 70th birthday) and were looking for a reporter to hop on. 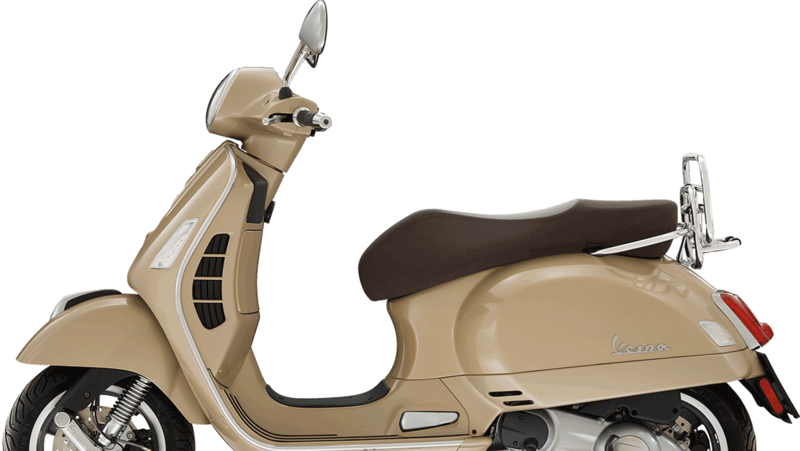 I had previously spent a few days on a 150cc Vespa Primavera, but this was an opportunity to experience twice the power and R130,000 of design and technology. I could almost feel those Italian cobbled streets beneath the wheels. Destiny, it turns out, has a twisted sense of humour. The week I picked up the bike, Johannesburg froze into a giant icecube. Cape Town slipped us the nastiest cold front, which smashed a tornado into Tembisa (a tornado! ), flooded KwaZulu-Natal and covered the Eastern Cape in snow. It was as though someone broke the weather. Trying to enjoy a Vespa through brain-freeze is, as politicians say, a challenge. The first thing I learnt about the GTS300 is that it doesn’t “pull off”. It leaps. It lunges, forcing you to grip those handlebars. In that moment, when you twist the throttle, the bike feels weightless as it punches forward. For someone who has never experienced a 300cc engine, it is the unleashing of an all new power. It’s a crazy-exciting feeling. The bike doesn’t seem to need to build power - it’s just there. Immediately. On tap and at your fingertips, sending you rocketing ahead of the cars. In fact, if the GTS300 were a character in Game of Thrones, it would probably be called “The Devourer”. Why? Because it devours uphills. Smaller bikes tend to exhale as you push them up the hills, especially steep ones. They try, they really do, but they just don’t have the power. This one does. And it adds so much to the experience. The GTS300 is not a small bike and, with the extra power, you don’t feel like the smallest animal in the jungle. It keeps up with any traffic flow on any road and even on the highway, at 120km/h, there’s more kick if you need it. Scooters and highways don’t really go together, but if you need to hop on and off, this is the scooter to do it on. The ABS brakes are a dream and the suspension handles those knuckles in the road. As someone who drives to work before the sun rises, I was blown away by the bike’s headlight. I know it’s a small thing, but as someone who’s had to squint away the shadows by the equivalent of candle light, this is a real win. On any bike, how visible you are and your own visibility are crucial. When you flick the brights on the GTS300, a perfect circle of light (think: Stargate portal) is thrown up onto the road, helping you catch that pothole in time. Turning corners tightly with such a strong engine takes practice but the balancing is superb and the bike feels solid, even if it can sound a little rattly. The tank is about 9 litres, which will allow you a good few days, or even a week, of riding before the next fill up. And at about R100 for a full tank, you can laugh at all your friends with Hiluxes. For me, what set this bike apart was its power. But for those discovering Vespas it’s the little pleasures, like being able to charge your cellphone in the cubbyhole. Someone figured out that sometimes a bit of petrol splashes out of the tank while it’s being filled up, and designed a catch area to protect your belongings. That same someone also realised that once the helmet is in the well, there should be a bit of extra space for your gloves, scarf or glasses case. When the sun is blinding you, a Vespa helmet has a Top Gun-style visor that helps. It’s the subtle luxuries and, as I’ve written before, it’s that second glance you give the bike as you walk away from it. I know that every guy who’s ever wanted to ride a fast bike says this, but the extra power does create a feeling of safety. You pull away faster, you get through a tight spot quicker and you overtake confidently. While you’re at it, you also get a bit of adrenalin bubbling. The GTS300 is a fun bike and going back down to a weaker engine is torture. Once discovered, it can never be un-discovered. Un-experienced. Like The Matrix. You swallow that red pill, and the city streets will never be the same. Article originally published on EWN.